If you’re already breaking out in a cold sweat just thinking about back-to-school lunch packing, boy-oh-boy, do I have a treat for you! 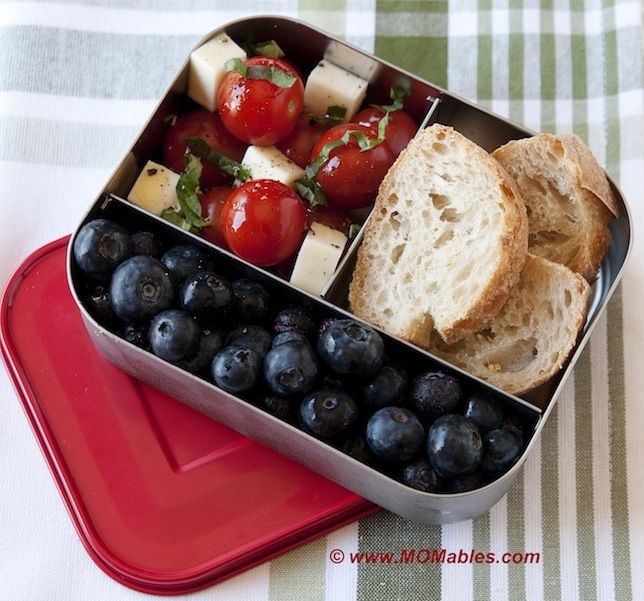 My sweet friend Laura over at MOMables is here to share her top five tips for making lunch packing a simpler process. Laura is an expert on all things lunch and spends much time in teaching busy parents how to make wholesome school lunches in 10 minutes or less. So whether you’re packing a lunch for 1 or 10, I know you’ll appreciate her time-saving tips and inspiring ideas below! Back-to-school season is upon us and that means getting organized as families, so we can meet the challenges of homework, after school activities, club meetings, household duties, cooking meals, and of course … school lunches. If the thought of getting it all done overwhelms you, don’t worry; you are not alone. Many of us struggle with this time of the year because it means that the fun and free-for-all-summer is over and our early morning devotional time is now shared with making sure our children are clothed, fed and ready for school. Every parent I know, wants to pack a wholesome school lunch for their kids, but packing them daily can be a challenge. Many get started making wholesome lunches every day, but then run out of steam and ideas after a few weeks. The good news is packing a wholesome lunch doesn’t have to be difficult. Fresh is always best… and it can also be easy! All it takes is a little preparation and know-how to get a smooth routine in place. Plan ahead. Putting together a full family meal plan, even for lunches, ahead of time is the ultimate time saver. It’s much easier to pull out the ingredients and assemble a quick lunch, when you already know what to make! 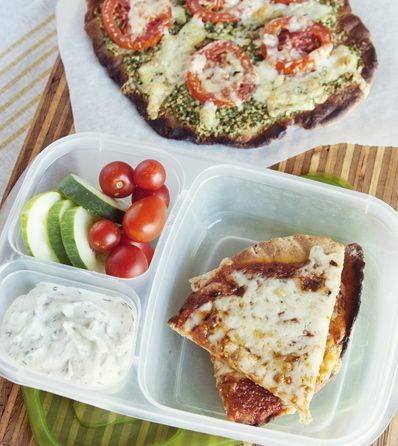 Repurposing dinner leftovers into something delicious for lunch is simple when you have a plan. No one likes to stand in front of the fridge with that deer-in-headlights feeling daily. Making the most of leftovers is easy when you know what you’ll need for the week. Having pasta for dinner on Monday night? Boil extra noodles and plan for a pasta lunch on Wednesday. It’s really that easy! Keep it simple. When I develop our menus for MOMables, my goal is to provide nutritious lunches that take 10 minutes or less to assemble. Don’t have time to make intricate butterfly-shaped quesadillas? Me either. Opt for minimal fresh ingredients, few steps, easy assembly and forget the rest. Many lunch cookbooks and bento websites have great ideas, but the intricate shapes and numerous ingredients can be discouraging. Use a simple sandwich cutter, if you want to get fancy, but leave out anything that requires special gadgets, elaborate ingredients, processed foods and lengthy recipes. Prep ahead. Slicing and dicing fresh vegetables can seem time consuming when you’re trying to hurry and pack lunches during late nights or rushed mornings. A great time to prep them is when you get home from the market – simply take a few minutes to clean and cut what you’ll need for the week ahead. This way, you’ll have servings of fruit and veggies ready to grab-n-go when lunch packing. This will also save you money, because buying those items pre-cut can be expensive. You’re also less likely to find that “mystery fruit” stinking up the back of your refrigerator that never got used and now have to throw away. Remember: A few minutes of your time = savings in your pocket book. Pack a few days at a time. Sounds crazy, but it’s actually very easy. I take one hour on Sunday nights to boil pasta, cook rice or make anything that is not part of my dinner meal plan for the week ahead. I use these to repurpose dinner leftovers for lunch. I pack Monday, Tuesday and Wednesday in containers and label or color code the box to its owner. We have thermos Thursday and pizza or leftover Fridays. This makes packing a wholesome lunch simple, efficient and time saving. –Laura Fuentes shows parents how to make fresh school lunches over at MOMables™. A wife, mother of three and a lunch enthusiast, Laura insists on healthy, wholesome food for her family. On her personal blog, Super Glue Mom, she writes about managing motherhood on a deadline. She’s also a food contributor and recipe developer to numerous sites, and helps busy parents overcome the difficulties of cooking real food in a hurry. You can find Laura on Twitter and on Facebook and MOMables on Twitter, Facebook and Pinterest. *Disclosure: If you opt to purchase using any of the affiliate links in this post, a small portion of the sale goes to support The Nourishing Home at no additional cost to you. There is no obligation to purchase, but if you do, you are helping to support the free resources, meal plans and recipes here at The Nourishing Home. Thank you! 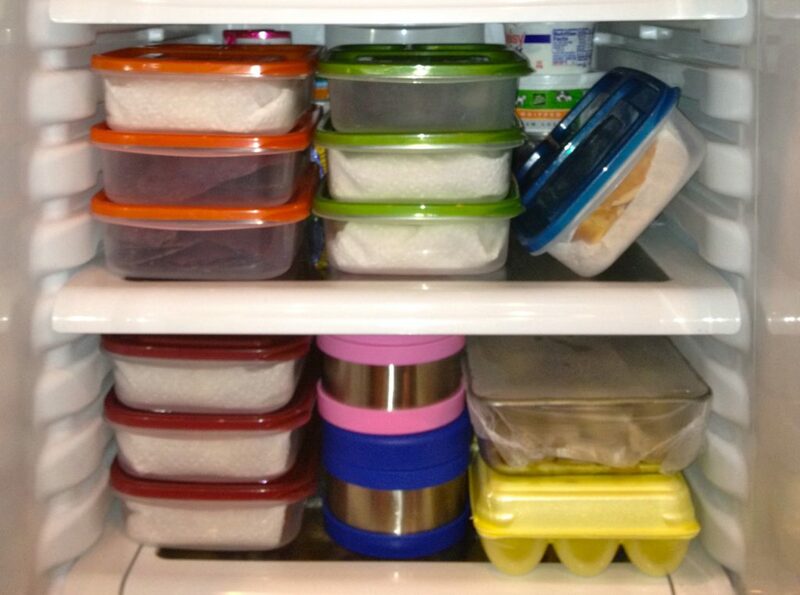 The top container is a Lunchbot, the one with the pizza is an Easy Lunch Box and in my fridge you see Easy Lunch Boxes and two thermos containers. I primarily use the easy lunch boxes because I can easily use them to pack ahead (they are affordable and you get 4 to a pack). Hi. Have been getting ready for back to school and was looking for new lunch ideas. 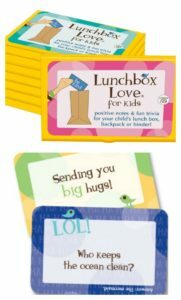 I also have looked at multiple new “lunch box” ideas mostly for the varied containers option. I wanted to share the Rubbermaid has come out with a new product called LunchBlox. They are convenient and inexpensive and have an ice pack that sits nicely in the stack. They also have a lunch bag to carry them in. Target was having a sale and with the online coupon I got each of my kids an entire set up for less than $18. Can’t wait to start making their healthy lunches! Is the paper towel to absorb liquid or keep the food off of the plastic? I use the hard clear bpa free plastic containers for lunch as I read they are less reactive. That is also why I don’t pack food until the last minute and if i can I stick some wax paper under it. I like the lunch bots but find them a little small for a teen. Would lover to see some actual lunches. My regular is always a salad, container of veg, some sort of leftover… Grilled chicken, turkey burger etc and berries or applesauce. Thermos of soups in cold weather. Hi Nancy! The paper towels are moistened (not wet) to keep the bread from drying out. Those Easy Lunch Boxes are not air tight so when air comes in it dries the bread (just like it happens if you leave them on a plate for hours -except a a MUCH slower pace). the moistened paper towel also serves to wipe off “sticky” hands after eating sandwich at lunch. I think those were pb&j rolls, and the other banana and almond butter. If i pack them on other containers where they are airtight, that doesn’t happen (like my husband’s lunches) but I have young kids that need containers that are easy to open. My cousin (who lives with us and is 16) can use any container and she doesn’t need a paper towel to either keep it moist or wipe her hands. Naturally she is a much neater eater than my young ones. We have a lot of pictures of actual food on our site for free, or you can sign up to receive our newsletter and receive them weekly. I’m honored Kelly allowed me to be here this week sharing some lunch packing tips with her readers. BTW, we LOVE the stainless steel lunch containers! Rachel, I pack lunches even on the days my kids are home during the summer. It stops nagging for snacks, trying to figure out what to eat or even doing a quick “drive-through” when we are out for errands. I am a year-round lunch packer. 🙂 We have lots of home-schooling subscribers on our site too. You can never have enough fresh lunch ideas. thanks for reading my post! My preschooler lets me sleep in if I have a “lunch” packed in the fridge for her to grab and start eating for breakfast. So now I either pack extra food for breakfast AND lunch in one, or pack two and put the lunch one on a higher shelf. We use the EasyLunchboxes as well, which she can open herself, and she knows the green and blue lidded ones are hers (red and orange are mine) so I don’t have to worry about her grabbing the wrong one. Not that I care. She is welcome to my veggies if she’d eat them! It also helps when she’s wanting breakfast the same time as the baby. Someone is left whining and crying while I feed the other one, unless I have a “lunch” already made up! I love Easy Lunchboxes! Thanks for the tips. Wow! great post. It has my wheals spinning for my husband’s lunches! I would love to be able to pack ahead of time… it is brutal to pack the night before or first thing in the morning! I am curious though, when you use the thermoses, how do you reheat the food inside if you are packing ahead? Would you bring an extra cup or something to put them in the microwave? Thanks! Jessalyn, I am huge on using thermoses to repurpose left overs. The key to a) keeping the food warm, b) not allowing it to spoil and c) packing ahead with it is the following: proper cooking of your food and proper heating of your thermos. Assuming that you’ve cooked your meats or dish ingredients to a safe temperature (ie. killing all bacteria), the risk of contaminating food is VERY low. First understand that thermoses are double insulated containers. the space between the two walls is what determines if your container is to keep the food warm or hot. One of the thermoses in my fridge is empty, the other full. The one that is full has fruit and yogurt in it. That happened to be a parfait my husband was bringing to work the next day for breakfast. By placing the thermos in the fridge to cool, the air space between the two “walls” also gets cooled and so does the yogurt and fruit. Now you have cool yogurt for about 5hours. I have a thermos question. The ones I found say it keeps hot food hot for 5 hours. Lunch for my daughter will be 6 hours after I pack. Will the food still be warm? I don’t want to send cold soup, lasagna, etc. This is our first year to pack a lunch. I always do my own bentos, etc (I teach) and do use a microwave to reheat (sorry). But food for my daughter has to be sent how it will be eaten. Also, guess I need to do some microwave research now. Hi, Cara. I don’t use thermos in my kids lunch because of similar issues and I worry about food contamination with it being in there for so long, so I stick with cold lunches. But I’ll send a note to Laura so she can respond. A study published in the the Journal of Science of Food and Agriculture found that broccoli cooked in the microwave lost up to 97 percent of its antioxidant content. Also, it is widely known that vitamin B12 becomes completely inactive once heated in a microwave, as well as many more important nutrients. In the book “Health Begins in the Colon” – Dr. Group explains how a microwave changes the molecular structure of the food by the process of radiation. The radiation breaks down any vitamins and minerals in the food and changes its natural structure. Your body cannot handle these irradiated molecules and they eventually weaken your immune and digestive systems, and don’t provide you with proper nutrition. Dr. Mercola recently quoted another study where it was discovered that microwaving can destroy the essential disease-fighting agents in breast milk. The study found that microwaved breast milk lost lysozyme activity, antibodies, and fostered the growth of more potentially pathogenic bacteria. Since the microwave unnaturally cooks food from the inside out, unlike traditional heating methods used since the beginning of time that cook food from the outside in, much damage is done on a cellular level to the food – actually changing it at the molecular level – as Dr. Group describes in his book, which is based on research on the effects of microwaving. What I’ve heard from someone who works with microwave technology is that any form of cooking breaks down the nutrients, and the studies showing microwaves are bad have ONLY studied microwaves (ie: nuked foods vs raw foods.) Or unbalanced comparisons. 10 minutes on the stove is not the equivalent to 10 minutes on high in the microwave. Microwaves might actually be better, since the cooking time, and thus the nutrient-killing-time is reduced. And it doesn’t actually cook from the inside out, which is a common misconception. It cooks it through the whole thing evenly, rather than the outside in. Again, reducing the nutrient-killing that the outside is subjected to longer in traditional methods. Hi Cara! I also have to send the food “the same way it’s meant to be eaten” for my kids. Check the comment above on how to properly heat a thermos. Yes, most thermoses keep food items hot for up to 5 hours but that doesn’t mean that the food gets “cold”. If the container has not been opened at all and you’ve pre-warmed it before hand, the food actually stays warm much longer. That said, kids rarely eat the food “hot”. By hot I mean the temperature off the pan or pot. they tend to eat it warm. You should be fine. You can always “test” this on a saturday or sunday if you are worried about how long it will keep warm. I cannot stress enough pre-warming of a thermos. Awesome tips! I REALLY need to start planning for the week. I think that’s the key that I am missing to speed up the process. Great tips. Even if you ARE making intricate butterfly-shaped quesadillas! One of my first forays into lunch packing was making my own Lunchables. My daughter refused to eat lunch meats, until I started cutting them with a mini cookie cutter. But the low-nitrate meat cut at the deli had such a short shelf-life, so I’d cut it and then freeze it in single-serving snack baggies, all inside a freezer bag. You can do this with cheese as well, but you want to be sure and cut or shred the cheese before freezing! Planning ahead really saved me a lot of time… too bad I’m not organized enough to keep it up! I’m the “staring at the fridge waiting for inspiration” kind of packer now!